Looking up through the window of a shuttle bus, the majesty of Zion National Park passes by quickly in a montage of red, white and green. Getting off the bus at its stops and taking in the park slowly brings the steep cliffs and fanciful rock formations into a focused clarity of sharp stone, deep canyons and rounded sandstone. You find yourself looking up from the bottom of a massive canyon. Standing still or hiking is a starting point to appreciate the beauty of Zion National Park. 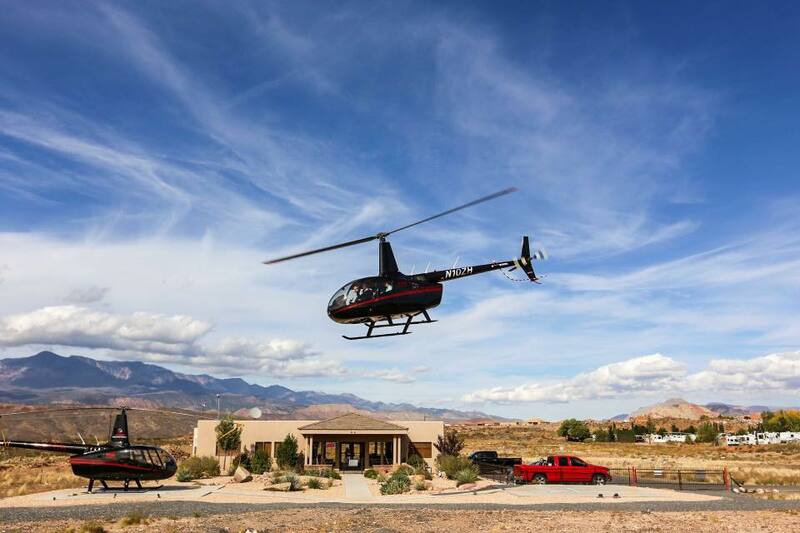 For a thrill, try an elevated view of Zion’s grandeur by helicopter. From the air, you can see an overview (literally) of Zion’s expansive natural wonders. You will be able to see miles and multitudes of slot canyons branch off from the main park that go unseen by most Park visitors. A paint box of desert colors splashes across the rugged landscape beneath you. The aerial view reveals the results of cataclysmic forces that fashioned the park into the imposing wonder it is today. You can see the seemingly separate monoliths, sheer cliffs, cliff edges and narrow canyons where they link together to form the whole of Zion National Park. Seeing Zion from the air is an unequalled experience. It starts with the surge you feel the moment the helicopter breaks free of gravity and lifts off the helipad. You rise into the clear blue sky and watch the ground below you recede. Earthbound objects shrink even as you ascend, and the world begins to reveal its massively intricate landscape imperceptible from an earthbound vantage point. Mundane features of the land are revealed in their true scenic beauty from the air. You fly over rarely seen desert backcountry, and as you rise higher into the sky, the mountains from which Zion National Park is carved come into view. You fly over a wilderness vastly expanded beyond what the people in their now diminutive cars far below you can apprehend. Slot canyons slash through the mountains ahead as if a cosmic-sized bear mauled the landscape to unearth a buried honey trove. The edge of the canyon approaches, its sides rising majestically into the Three Patriarchs and the narrow ribbon of Angel’s Landing. On foot, Angel’s Landing towers precipitously above the Park’s floor far below. From your aerial perch, the landing and the intrepid hikers ascending it coalesce below you among the rising cliffs as part of the aerial scenic vista stretching out before you. If that is the Angel’s Landing, then you must be gliding among the angels themselves. Cruising airborne above the canyons and watching the majestic formations flow beneath you is mesmerizing. 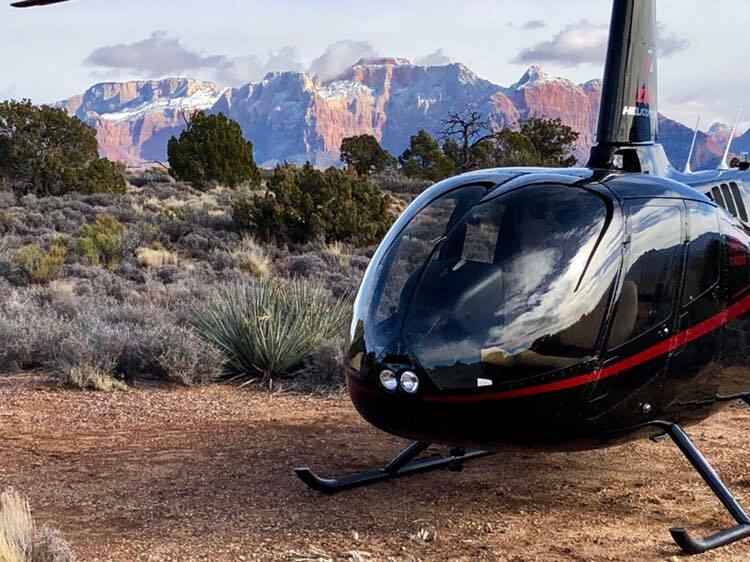 After you have toured the park, walked the trails, and hiked to Angel’s Landing, to make the most out of your visit to southern Utah and appreciate the overall splendor of Zion National Park, add a helicopter tour to your trip and experience it by air.